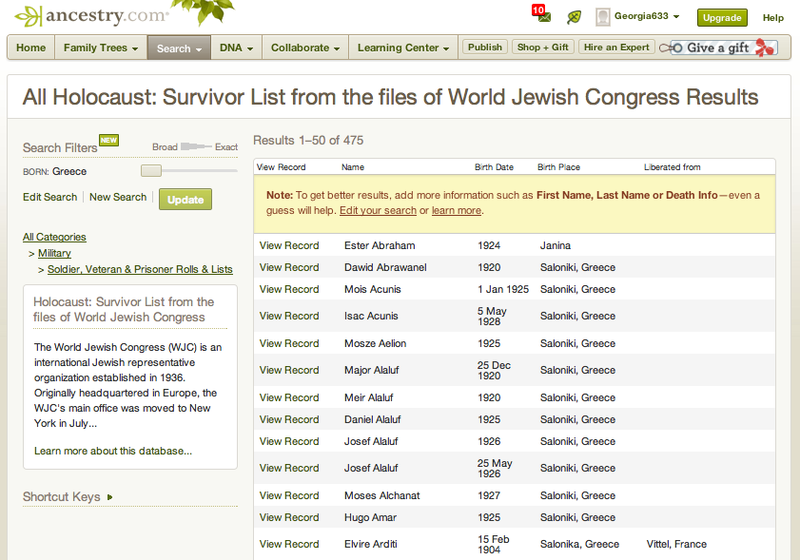 Ancestry.com has a database online that is titled - HOLOCAUST SURVIVOR LIST FROM THE FILES OF WORLD JEWISH CONGRESS which includes 475 entries for those who listed Greece as their place of birth or last residence. You can also do a search directly on the World Jewish Congress website. The World Jewish Congress (WJC) is an international Jewish representative organization established in 1936. Originally headquartered in Europe, the WJC's main office was moved to New York in July 1940 when most of Europe was overrun by the Nazis. The World Jewish Congress collection (1918-1982) consists of the archival records of the New York office. A partial listing of major subjects dealt with in the entire collection include: anti-Semitism, human rights, Jewish communities in various countries, Jewish displaced persons, Jewish-Christian relations, immigrants and immigration, Jewish culture, relations with governments and non-governmental organizations (including the United Nations and the Red Cross), restitution, reparations, Jews in Germany, Soviet Jewry, World War II, western hemisphere Jewry, Zionism, war crimes, and crimes against humanity.